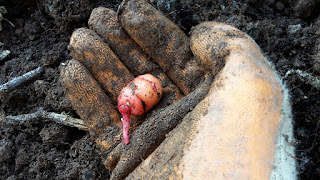 A couple of days ago (before this heavy cold frost) I had a dig around my Oca (New Zealand yams) bed (this post is in response to Sol asking when to harvest them - in truth it's a guessing game!). We had a frost that killed them the earlier in the month so I left them a good three weeks, where the tubers are then meant to swell, the later this happens in the year the better as they only form the tubers as the days get shorter. I only dug up half the bed and I was very disappointed by the results, the tubers are all small and very few in number. Compared to last years harvest where I had a couple of buckets worth it's going to be slim pickings with only enough to replant really. I'm going to leave the other half in the bed a little longer and see if that makes any difference to the size of the tubers. All i need to worry about is pests and them rotting in the ground so it's a bit of a gamble. It's a shame as this is a crop with such potential, but it needs some development to make it a predicable crop that produces tubers eariler. I've recently joined the Guild Of Oca Breeders to help to try out new varieties in the hope of finding some that crop earlier. I'll do a post about what they get up to another time, I just need to decide how much space I should dedicate to this crop in future - when it's good it's very very good, and when it's bad it's dreadful! Who else has harvested their yams yet? It's always a guessing game with root crops because you can't see whats happening under the soil. The potatoes I great in a tub last year were enough for one meal! Mine are still in the ground. They've been pretty much ignored in the polytunnel actually as I didn't plant any ... these were obviously what I missed digging up last year, so anything I get will be a bonus. Although to be honest we don't really feel they are a vegetable worth growing, so if I manage to dig them all up this year that will be it for us. Next year I being very non-experimental and growing the tried and trusted basics that we know we like and that suit us. It might sound boring but it will be much more in keeping with our simple living philosophy. I was going to have a go at these, but might now have a rethink. I had a similar experience with Jerusalem Artichokes, where we had plenty last year, and next to nothing this year. Mind you, this year has been pretty poor for most things on my allotment. They look very much like Jerusalem Artichokes; are they related? I grow JA's but haven't dug any yet. Ah, it's not just me then! Mine was the same as yours, maybe worse. It's my first time, so, mm. Perhaps it was bad weather, perhaps my (new allotment) soil wasn't great. I did wonder, because the plant tops were rather feeble too - I couldn't see them generating much energy. 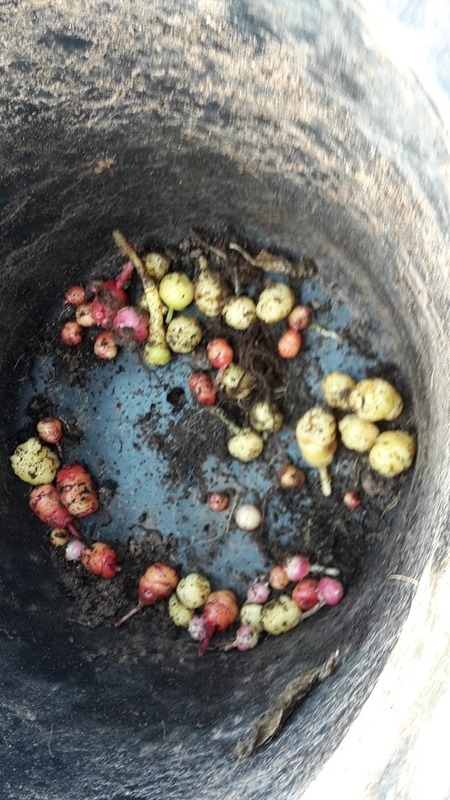 For what it's worth I'm going to try what I did with my Jerusalem Artichokes, which gave an extraordinary harvest: create now a bucket-sized hole where I'll be planting one, fill it over the course of winter with food scraps, then add the tuber in spring.